Soil acidity or alkalinity effect plant growth by influencing the chemical availability of nutrients in the soil for uptake by the plants. The measure of acidity or alkalinity, expressed as a number, is called pH. Plant roots absorb mineral nutrients such as Nitrogen and Iron when they are dissolved in water. If the soil solution (the mixture of water and nutrients in the soil) is too acid or too alkaline, some nutrients are not available for uptake. A pH of 7 means that the soil is neutral. If the pH is below 7, the soil is acidic. If the pH is above 7 the soil is alkaline. Most nutrients that plants need are readily available if the soil pH is between 6.0 and 7.5. When the pH is below 6.0, some nutrients such as Nitrogen, Phosphorus, and Potassium are less available to the plant.This is usually not a problem in Arizona. When the pH exceeds 7.5, Iron and Manganese are less available. 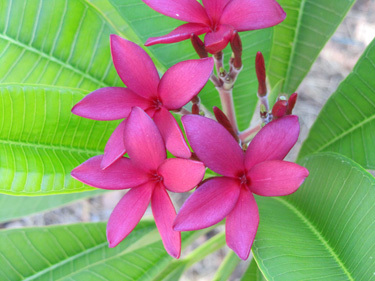 Plumeria plants do well when the pH is between 6.0 to 6.7 which means slightly acidic. The soil in Phoenix Arizona is relatively alkaline and salty. This means amending the soil will be necessary to have success with these plants. Please note that adding fertilizer here can be a gamble because, too much nitrogen can easily burn your plants beyond the point of recovery. A key to success is to start with a good soil which is explained in more detailed on the Amending The Soil page. Since the symptoms of vitamin and nutrient deficiency in plants can be hard to diagnose, we have included the guideline below that relates to all plant species and it is not specific to Plumeria but it is helpful to properly diagnosing nutrient deficiencies so you can determine the most appropiate fertilizer. Keep in mind that there are many plants that need neither vitamins nor nutrients and can grow at a healthy rate with nothing more than supplemental water. Some don't even need extra water. Cactus, for example, needs little fertilizer and only supplemental water during dry periods. In fact, giving cactus too fertilizer can kill them. In contrast some plants will show symptoms of vitamin and nutrient deficiencies in this climate no matter how they are cared for. Plants such as rhododendrons cannot be grown in the lower desert soil no matter how many amendments are added. Between these two extremes are plants that can be helped when nutrient and vitamin deficiencies show themselves. In Phoenix Arizona, most non-native plants will need supplemental nutrients at some point. The primary macro-nutrients (needed by a plant in larger amounts) are nitrogen(N), phosphorus(P), and potassium(K) exist in the soil in reasonable quantities but will be depleted relatively quickly by a fast growing plant. On most fertilizer bags the main numbers listed are the percent of the primary macronutrients in the fertilizer such as; 21-0-0 or 0-10-10, that is 21%(N), 0% (P) and 0% K.
The secondary macronutrients, Calicum (Ca), Sulfur (S) and magnesium (Mg) usually exist in enough quantity in soil that these nutrients are not always needed. Usually these nutrients will be only be added on occasion to modify the (ph) of the soil. These secondary macronutrients are important in correcting nutrient deficiencies in soil. Most micronutrients are also needed in small amounts and appear to be in ample supply in our soil with the exception of iron(Fe) and manganese(Mn) which are often chemically unavailable because of the high alkalinity of the soil. Since Plumeria need these micronutrients they will have to be added to the soil. Organic amendments such as compost will help the soil to naturally replace these substances, and they should definitely be used, but some types of plants will outstrip the soils ability to produce vitaminsand nutrients. Futhermore, a gardener might want their plant to grow more rapidly and be more productive than the natural rate. Of course the words natural and organic are a bit vague, and adding fish emulsion, one of my favorite fertilizers, could be classified as organic, but it is not really natural seeing as how fish are not jumping from the sea, crushing themselves to pulp, and spreading themselves in my garden. In simple terms Organic amendments are derived from living things and Inorganic are derived from minerals and chemical processes. The most dominant symptom of nitrogen deficiency are yellowing of the leaves and lack of growth. However, yellowing can also indicate iron deficiency. Nitrogen is the number one burner of plants when applied in excess so knowing the difference between these two is important. The answer to this riddle is that lack of nitrogen shows first in older leaves, whereas iron deficiency shows first in newer leaves. The reason the lack of nitrogen shows in older leaves first is that plants can easily move nitrogen around within themselves and that plants give preference to their newer foliage. Organic nitrogen fertilizers such as; Alaska Fish Emulsion 5-1-1 are good for the more sensitive plants, Osmocote Slow Release For Acid Loving Plants is good for the less sensitive plants that you need a slow release fertilizer for low maintanance. Miracle Grow works well for a quick application for the really hungry and very difficult to burn plants. Phosphorus deficiency causes older leaves to become dark green and have red or purple patches in them. The only plant I have observed a phosphorus deficiency in, in my yard, is a blackberry bush. Fertilizers that add potassium and/or nitrogen almost always add phosphorus so this may be the reason this deficiency is seldom observed here. Either that or because the soil in Phoenix has adequate levels of phosphorus for the majority of plants. 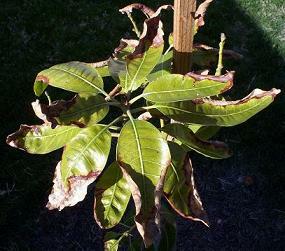 Potassium deficiency is indicated by a burning of older leaves. Unlike salt/fertilizer burn it is limited to older leaves. This, of course, can really slow a plant down because all of its older leaves drop prematurely, so the plant has trouble getting the energy benefit out of leaves that it spent a lot of energy growing. Heavy consumers of potassium appear to run short of it quickly here. Legumes like beans and pacay consume large amounts of potassium but need almost no nitrogen because they can pull nitrogen from the atmosphere and actually add it to the soil. They are referred to as nitrogen fixing plants. My favorite form of potassium is Alaska Fish Emulsion More Bloom 0-10-10 for my more senstive plants, Osmocote Slow Release For Acid Loving Plants for the less sensitive plants that I want a slow release for, and Miracle Grow Bloom Booster for the hard to burn plants. Calcium deficiency symptoms appear initially as localized tissue necrosis leading to stunted plant growth, necrotic leaf margins on young leaves or curling of the leaves, and eventual death of terminal buds and root tips. Generally, the new growth and rapidly growing tissues of the plant are affected first. The mature leaves are rarely if ever affected because calcium accumulates to high concentrations in older leaves. Sometimes even with sufficient calcium in the soil, it can be in an insoluble form and is then unusable by the plant or it could be attributed to a "transport protein" Soils containing high phosphorus are particularly susceptible to creating insoluble forms of calcium. Sources of calcium are dolomitic lime, gypsum, and superphosphate. Calicum is generally added to soil to low the (ph) of the soil especially alkanline soils that exist here in Arizona. Sulfur comes along with many other fertilizer products that I have use including gypsum, magnesium sulfate, and manganese sulfate. Sulfur is beneficial in general because it helps lower the pH and acidify our alkaline soil. Sulfur acidifies by being processed by microorganisms and turned into sulphuric acid. This affect is temporary but can help to give plants a temporary boost. Sulfur is also utilized by plants directly. Magnesium deficiency causes older leaves to yellow at the tips and then die back. It can look very similar to salt burn but can be distinguished from salt burn by the fact that it concentrates itself on older leaves and affects the leaf tip rather than traveling the margins of the leaves. I use magnesium sulfate (Epsom Salts) to add magnesium to my plants and for some of my plants that lingered with stunted growth for years. Giving them a little magnesium really made a big difference. I have found that loquat, pacay, palms and Plumerias trees benefit greatly from an occasional dose of magnesium. In fact, for my loquat, magnesium halted the dreaded crispy leaf problem everyone sees here and often attributes to fireblight. Palm trees are also large consumers of Magnesium. To apply magnesium sulfate I mix a three fingered pinch, (approximately a tablespoon) of agricultural grade Epsom Salts into a gallon of water and poor it around the drip line of the plant. 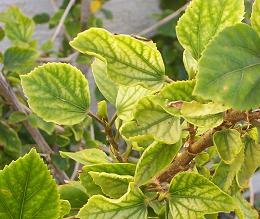 Iron deficiency is indicated by a yellowing that begins in newer leaves. The internal veins in the leaves are often still green, but this is not always the case and depends on the plant. Iron deficiency can also be caused by overwatering so make sure that a plant is being properly watered as a first step. Iron needs to be added to the soil in a chelated form, a fancy chemical term meaning that it will stay available even in high alkalinity. My favorite iron fertilizers are Ironite 1-0-1, and Greenlight liquid Iron and Soil Acidifier. Ironite has received some bad press in the last couple of years because of alleged toxic metals being present in it. Arsenic and lead levels were high enough to cause concern. The company appears to have adjusted its formulation since this controversy and the levels of these undesirable elements have been reduced dramatically from levels in the 1000's of parts per. million to levels in the single digits and less. Ironite chemical analysis by the State Of Washington Another thing I like about Ironite's latest formulation is that it has Boron and Molybdenum in it, two micronutrients that are not present in any organic fertilizers and are hard to find in other fertilizers. Ironite's strongest asset in general is that it provides the gardener a way to supplement the soil with beneficial inorganic elements without adding a lot of elemental nitrogen. Recall, that elemental nitrogen can burn sensitive plants. Greenlight chelated iron is also effective, but has fewer micronutrients than Ironite. Manganese deficiency shows itself in the new leaves of a plant. It looks very much like iron deficiency but causes brown dead spots in the leaves. Palm trees seem to need manganese more than other plants, especially queen palms. However, most plants can probably benefit from an occasional application. I give my plants manganese in the form of manganese sulfate. To apply it I mix a three fingered pinch of agricultural grade powder into a gallon of water and poor it around the drip line of the plant. These are the even more micro of the micronutrients. Still, tropical plants can potentially get short of them in alkaline soil. Boron, Molybdenum, and Zinc can be found in Ironite 1-0-1. Since Arizona is the Copper State, copper can evidently be found in huge supply in the soil here and shouldn't be a problem. Greenlight liquid Iron and Soil Acidifier is a source of copper if you decide you need it. See the links below for information describing the symptoms plants exhibit when they are short in one of these nutrients. Chlorosis is a symptom of a plant being nutrient deficient, and therefore unable to produce adequate amounts of chlorophyll. The photo on the right shows a plant which has chlorosis caused by iron deficiency. The plants newest leaves become more yellow than normal, with the veins on the leaves being the last part to turn yellow. A plants inability to take up iron is usually the result of one of two causes. 1) Soil is deficient in iron. 2) Chemistry of the soil prohibits the uptake of iron. Many plants cannot properly absorb iron from the soil when it is too alkaline for them or if the soil is too wet. Severe chlorosis can kill a plant. Root rot happens when a plant's roots are attacked by micro organisms such as bacteria and fungi. The most common cause of root rot is overwatering. Severe root rot can kill a plant. Salt burn is caused by excess salts in the soil. The best way to prevent salt burn in Phoenix soils is to deep soak the soil. Early evidence of salt burn is leaf curl, followed by the perimeter of leaves everywhere on the plant turning brown and drying out. The drying/burning will start at the tip and proceed along the edges to the base. Severely burned leaves will fall off. Many plants can withstand salty soil and persist for years while other plants will sicken and eventually die. Excess fertilizer adds salt to the soil, so one should be very careful when fertilizing salt sensitive plants. Salt burn, unlike potassium and magnesium deficiency, is evenly distributed across all leaves of the plant. Salt burned leaves start burning at their tips and progressively turn crispy along the edges of the leaves toward the base. Severely burned leaves may even drop off. It can be distinguished from sunburn, because sunburn will not affect shaded leaves. For an in depth discussion of minimizing the damage caused by excessive salt, go to the Amending The Soil page. Of course, it is best to avoid salt burn altogether by being conservative with fertilizer and only applying what a plant needs. If a salt burned plant is not killed outright it will stop growing for a while defeating the entire purpose of fertilizing it at all. Young and newly planted plants can often have their root balls invaded by larger established plants nearby. In Phoenix Arizona, planting next to larger shade trees is advantageous because of the shelter it can give from the afternoon sun, so this kind of intrusion is a common occurrence. The larger plant will take the nutrients, water and anything else it can get from the unestablished plant. The newer plant will show all kinds of nutrient deficiencies and stunted growth because of this. To remedy this situation, dig a trench between the two plants at a sufficient distance from each of the plants so that no serious damage to their central root balls takes place. Since the topsoil here is shallow, any invading roots can usually be found within the first 2 feet of soil. Use a mattock pick to hack away some the larger tree's roots will give the smaller plant some room to help establish itself. I have found the following links very useful in diagnosing plant nutrient deficiencies. The first 2 links, the "Generalized Guide" from NZ is very good. I have made a print out of both pages and take it into the garden with me for reference.